More in the Watercolor Flowers Series?!? No way, right? YES way! This one is way out of my comfort zone, too! 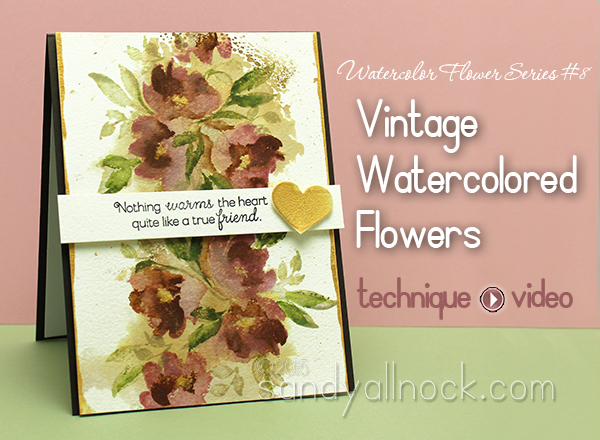 The Watercolored Anemones set from WPlus9 is a set created from a watercolor painting by Dawn (see it below the video), the owner of the company; she created it so we could all use our pigment inks and make watercolor-looking flowers with layering the stamps. But I wanted to see what would happen if they really had some watercoloring….so I tried it! Watch the video below, or check it out HERE on YouTube. Behind The Scenes: a peek at the inspiration behind the #wplus9 “Watercolored Anemones” stamp set releasing on June 5th. This one was painted for a very dear friend. I think this card was well worth all the attempts to make it work….what do you think? Another stunner!!! Love the contrast too! Thank you Sandy so much for this tutorial! I have watched it multiple times and have never tried the technique before, but I tried it and I loved the results! Thanks to you teaching this technique I was inspired to use it with many of my floral stamps. Blessings to you and yours. Absolutely beautiful Sandy!! That texture paste really is the icing on the cake!! Your flower painting is just beautiful – I love it! Thanks so much for sharing all the steps in your video!! Wonderful. You really don’t sleep, I believe. Some projects take me so long to get done and than I think of you and your inspiration. With that I know all will get completed on time with a little faith mixed in. These colors are just gorgeous! Really glad you added the contrast, it just brought those flowers to life! Thanks so much for sharing. Sandy, this is absolutely GORGEOUS! 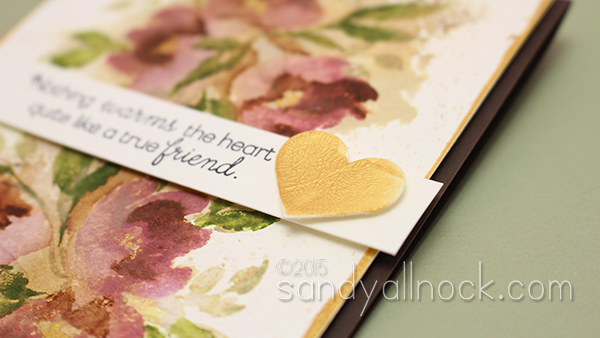 I love card and the colors, and that gold texture is fabulous! Need some of that! I am never disappointed visiting with you! Hugs! This is such a beautiful card. I would have passed on this stamp set but seeing what you did with it it’s going on my wishlist. Thanks for sharing your lovely work. Such a pretty image Sandy. I love the way it turned out and that gold, super. Thanks for sharing. I am in love with this! Such gorgeousness! I usually enjoy your videos, but this one is a whopper! I so identify with the contrast, bold colours etc. too. You keep that contrast girl because the way you use it is stunning. Gorgeous card. Gorgeous painting. Sandy, Sandy, Sandy! This so reminds me of some old valentines I found. This truly has the vintage look and the colors are perfect. I love watching you do what you do. I can only hope that someday I will create something with water colors that is half as good as yours. You are a true artist. You are an inspiration to all. Thank you so much for sharing with us. I LOVE this!!!! Absolutely gorgeous!!!! Absolutely gorgeous! I cannot remember ever loving any one card more. I love “vintage” and although I’ve never tried watercolor before I have to try this. Thank you for this beautiful work of art! Oh, so lovely! The flowers look like someone lovingly pressed them between the pages of a book, and you just took them out to create this beautiful card. There’s a whole story there that’s making itself up in my mind! 🙂 Very romantic art. Gorgeous! You’ve pushed the edge of your comfort zone to new extents beautifully. Beautiful!!! I love the antique feel of this card. Thanks for sharing! oh my goodness!! this is just too fabulous for words! the antique look you gave the flowers is so beautiful and the gold touches make this card so extraordinary; just love this! thank you for this amazing inspiration. Beautifully done. Thanks for sharing you video how to with us. Love it. I like you like the contrasting colors too. Very pretty and that gold paste was a nice addition. In looking at the stamp set I would have never thought it could be turned in to something so beautiful. I love everything about the card and am so appreciative of your talent and artist’s eye. As always, thank you for sharing your gifts with us. Not sure you wanna live in there … lol!